The year was 2016, and the Imperium Alliance was in a virtual arms race with the Moneybadger Coalition which previously was the CFC. At that time the coalition was being funded by a player simply known as Lenny; Lenny ran an online casino and his profit funded the Coalition in their war against the Imperium. The war came to a head when the two factions collided and started a skirmish that cost players a total of three hundred thousand dollars. The reason for this amount of damage is because the economy in the game is only slightly more difficult to understand than real life economics...of which I’m not an expert and I’m still holding onto my Litecoin in hopes of resurgence of the almost dead currency. 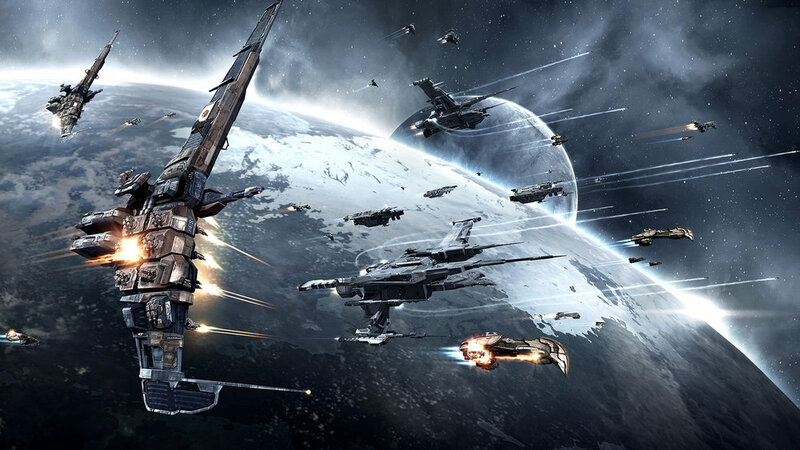 EVE Online has an open economy that is driven primarily through trade and production. Of course like most Online games you can purchase items from NPC (Non-player Characters) however that's not how to make money. From my very basic understanding the three ways to make a digital living is to either: mining materials to trade to builders, build ships and equipment to trade back to miners or raiders, and raiding miners to steal their resources to trade to builders or to raid builders to steal their resources to sell to either miners, builders, or other raiders. By now you have to wonder why you would do anything but raid other players...coalitions or guilds to use other game terminology. Hypothetically us here at Gaming and Chill decided to play EVE together, however we have some other friends who want to play to...so we build a faction. Some people really take a shine to mining and others building. Our players will need protection right? Well our builders could build vessels of war to protect our trade routes and mining facility. Now we have players who’s sole responsibility is to protect our other players and to open fire on any other vessel who threatens our coalition. The games economy is very similar to the Age of Pirates, the British hired mercs to protect their shipping lanes and if those mercs weren’t paid on time or to their liking they became pirates. Many coalitions have stricter “hiring” policies than most jobs I know, most require you know a member of the coalition and you have to be properly vetted. Even upon entry you are barred from meeting discussing bigger business plans...you only know what you need to know and nothing more. Its as if the Mob and the CIA had a bizarre baby and it was born into the world of the opening crawl to Star Wars Episode 1. “Turmoil has engulfed the Galactic Republic. The taxation of trade routes to outlying star systems is in dispute. However it’s my extreme joy to tell you that this week with a strong possibility that today the two biggest fleets in the game could launch an assault breaking the three hundred thousand dollars in damage and could possibly break one million dollars. Now I’m personally excited because that's a lot of damage and the GIFs and screengrabs in the following weeks will make a great desktop background at work. If your a player of EVE and specifically your in one of the two factions poised for war I would love to talk to you and get your thoughts on the battle, your personal stake in the war, and how you started playing EVE. You can contact me at @President_Doug on Twitter, even if your not in one of the factions I’d still love your opinion on the whole ordeal and how you suspect this will impact the economy for you and your coalition. As always thank you for giving this article a read and it would definitely help me a great deal if you could send this article to just one person. That’s all I ask one person and whether or not they read that doesn’t matter to me, you’ve done your part.